Paddle Faster I Hear Banjos Recalls "Deliverance"
Funny t-shirt for "Deliverance" fans. Paddle Faster I Hear Banjos is a great t-shirt for canoe sportsmen or pig callers. 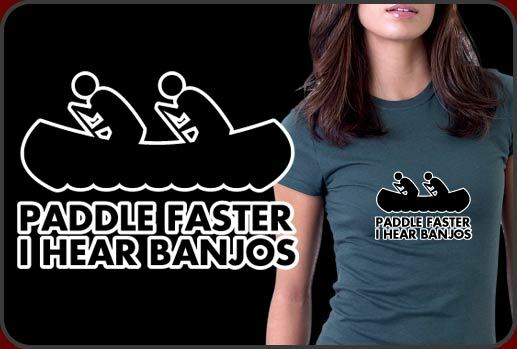 Paddle Faster I Hear Banjos is one of our hottest selling t-shirts on the site. It's an instant classic that reminds us all that canoeing in the mountains should be done swiftly and with high powered weapons. For years now, the movie Deliverance has scarred mankind with nightmarish squeals echoing through hillbilly mountains. Our Paddle Faster I Hear Banjos shirt is actually good therapy for those who suffer from fear of canoe adventures. Paddle Faster I Hear Banjos is a hilarious t-shirt design that looks terrific on just about any color t-shirt and belongs in anyone's collection. Be sure to check out all the cool Paddle Faster I Hear Banjos gear too. We have mugs, caps, buttons and lots more Paddle Faster I Hear Banjos goodies just for you!